With the success of Google for Work it’s now time to move many of your line-of-business processes over to G Suite. This post introduces how you can build-up custom data-driven solutions using Google Sheets. The Report Builder is an exciting way to find answers to your specific questions and manage & share data. All using simple Excel-like methods you’re already comfortable with, right from within Google Sheets. 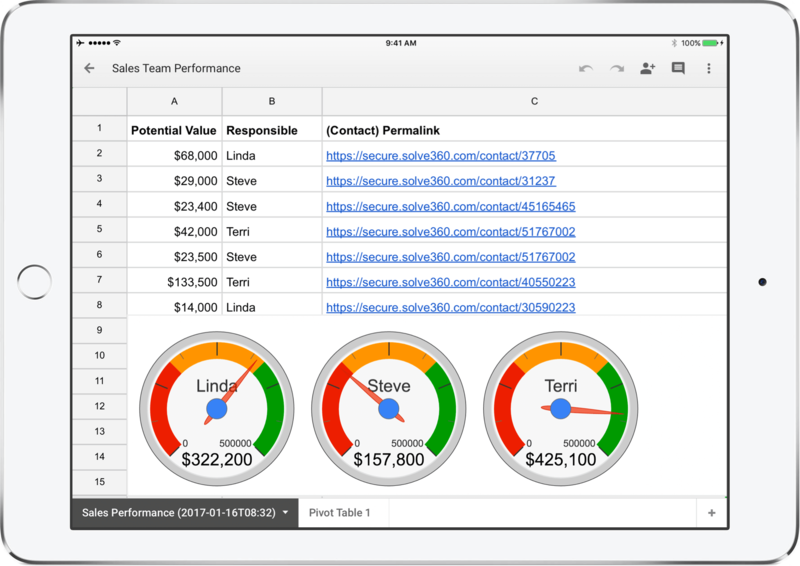 Solve’s Report Builder makes it easy to pull your select data into a Google Sheet. In just minutes you can turn that data into pivot tables and colourful charts that you can share with your team and update with the click of a button. Once you’ve created a report, set Solve’s Report Builder to automatically update it on an hourly or daily basis, even when the Google Spreadsheet is closed. The date and time of the update is automatically added to the sheet’s title to confirm how fresh the data is, bringing live report data to your favourite devices. Maintain and share separate datasets in Google Sheets, which you can link Solve records at the push of a button. Take a moment to enable Solve’s Report Builder add-on in Google Sheets, then begin move forward by drawing inspiration from our best practice examples.